Glowedge is a PMMA_posterior chamber intraocular lenses with 360° Square Edge optics. GLOWEDGE PE5225 Aspheric IOLs are made of PMMA material. It has 360 Degree sharp edge on the posterior side of the lens and aspheric optic on anterior surface. 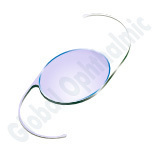 Glowedge lens are designed with 360 Degree sharp edge on the posterior side of the lens and aspheric optic with zero aberration on the anterior side of the IOL. This sharp edge of the IOL prevents the epithelial cells migrating to the posterior side, thereby reducing the PCO (Posterior capsule opacification) rate. 360 Degree Square Edge on posterior Side. GLOWEDGE PE5525 Aspheric IOLs are made of PMMA material. It has 360 Degree sharp edge on the posterior side of the lens and aspheric optic on anterior surface. Glowedge lens are designed with 360 Degree sharp edge on the posterior side of the lens and aspheric optic with zero aberration on the anterior side of the IOL. This sharp edge of the IOL prevents the epithelial cells migrating to the posterior side, thereby reducing the PCO (Posterior capsule opacification) rate. GLOWEDGE PE6025 Aspheric IOLs are made of PMMA material. It has 360° sharp edge on the posterior side of the lens and aspheric optic on anterior surface. Glowedge lens are designed with 360° sharp edge on the posterior side of the lens and aspheric optic with zero aberration on the anterior side of the IOL. This sharp edge of the IOL prevents the epithelial cells migrating to the posterior side, thereby reducing the PCO (Posterior capsule opacification) rate.